Sowing grass seed in snowy conditions won't cause it to germinate any more quickly and may actually damage it. But a seeded lawn, planted at the appropriate time and carefully maintained, will thrive--usually within the first season. Lawns grown from seed are often healthier than sodded lawns and cost a fraction of the price. Grass seed, particularly Kentucky bluegrass, needs warm soil temperatures to germinate. Grass seed sown in snowy conditions will lay on the soil surface until warm temperatures return. Early spring warmups may cause grass to germinate, only to be killed by late spring snows. When few other food sources are available, hungry squirrels, mice and birds will happily devour grass seed that lays exposed on the soil. Grass seed sown during snowy conditions becomes nothing more than expensive bird seed. Grass seed needs constant moisture to germinate. The water provided by melting snow in the spring could theoretically hasten seed germination, although the potential risks of scavenging animals and late spring frosts probably outweigh any benefits. Plant grass seed between Aug. 15 and Sept. 15 in temperate climates, advises Ohio State University. Grass seed planted later in the fall is likely to fail because it does not sufficiently mature before snow arrives, killing the young plants. Grass seed planted in the spring must contend with hot, dry temperatures, weed growth and diseases. Cool temperatures and plentiful rain make early fall planting ideal for many gardeners. Spread grass seed at the rate appropriate for the grass type. Excessive seeding won't improve the lushness of the grass, according to Cornell University, but will cause grass to be overcrowded, competing for nutrients and water. 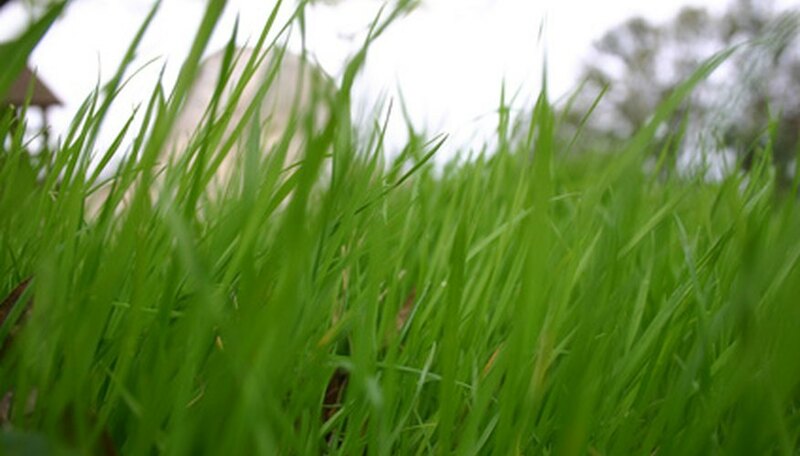 Spread grass by placing half the recommended amount in a drop or rotary spreader. Spread seed in one direction, then spread the remaining seed by walking at a right angle.